Die bittre Gute, oder Das Gesäng der einsamen Turtel-Taube, Manuscript hymnal from Ephrata Cloister, 1746. 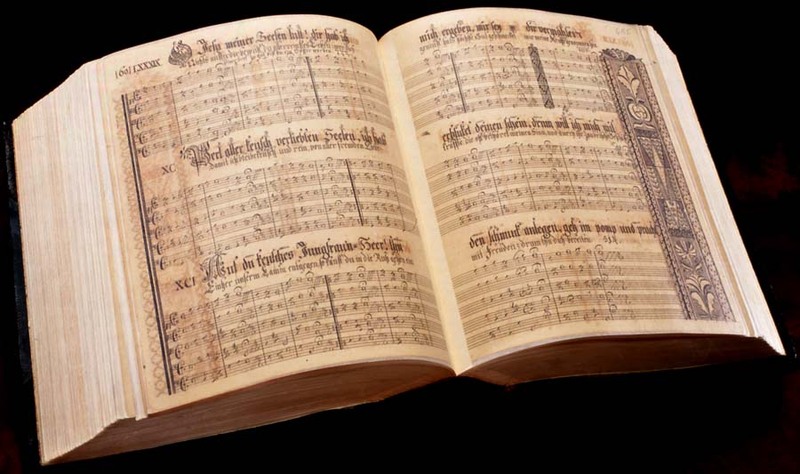 A masterpiece of fraktur, this hand-lettered songbook contains hymns sung by the Brothers and Sisters of Ephrata, some of which were composed and written by Conrad Beissel. The manuscript inscription speaks of "The Bitter good, or the song of the lonesome turtledove, the Christian church here on earth, in the valley of sadness, where it bemoans its `widowhood' and at the same time sings of another, future reunion [with God]."